One metal is defying the general gloom of the mining markets. Its price has gone up by over 800% in the past two years and is now near an all-time record high. And "all-time" is a long time for this metal. It has roots in the B.C. era as the material that allowed Damascus swords to be so strong and flexible. In the modern era, it was one of the ingredients that allowed Henry Ford's Model T to be such an early hit with the masses. It was even touted in early advertisements for the car. And you may have seen it in the headlines recently because prices for it are truly reaching new highs on what seems like a daily basis at this point. It has created a media and investor frenzy reminiscent of lithium and cobalt. And frenzies like this, though they can be short-lived, are where a lot of money is made in the mining world. 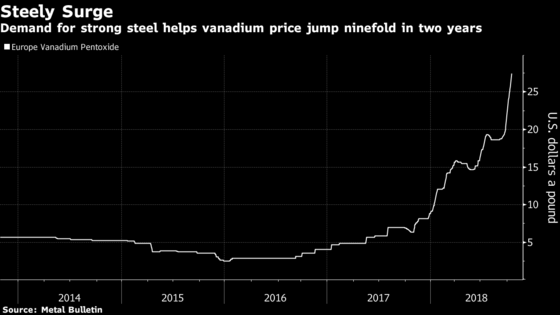 The short version of this boom is that vanadium is used as a strengthening agent in steel — the same way it was in Damascus swords all those years ago. Globally, a certain percentage of vanadium is required to be added to steel for this purpose. In November, China increased the amount of vanadium required in steel produced there, which effectively doubled its internal demand. China makes half of the world's steel and also produces the bulk of its vanadium. And this change is expected to turn it from a vanadium exporter to an importer. About 90% of vanadium demand is for its use in steel. But it has a new and growing use as a major battery fuel that's making markets doubly excited. Vanadium redox flow batteries are proving to be big winners in the industrial-scale battery world, where they can store vast amounts of intermittent solar and wind energy and also release it to help even out peaks and troughs of grid demand. "I don't think anyone would dispute that it's superior to lithium-ion in large-scale grid applications," said [Anthony Milewski, a managing director at Pala Investments Ltd. in Switzerland]. Ultimately, the only thing that matters for industrial-scale batteries is cost. And it's what severely limits lithium-ion batteries when they're attached to the power grid. The cost is too high, compared to just adding more generating capacity, to the point where it won't be a long-term solution. The problem comes from an insurmountable issue. The lithium-ion batteries that Tesla and other companies are using will always be several times more expensive than the cost of simply producing more energy. It's a matter of basic chemistry. Lithium-ion batteries lose capacity over time, and efficiency falls off dramatically over a few decades. As a result, the cost of using ordinary batteries for utility-scale storage bottoms out at around $0.30 per kilowatt-hour (kWh). They price themselves out of the market by tripling the total cost of the power stored. Vanadium flow batteries are nonflammable, compact, can remain uncharged for long periods of time, discharge 100% of the stored energy, and won't degrade for more than 20 years. And as a result of their unique properties, vanadium flow batteries reduce the cost of power storage to about $0.05 per kWh. In short, they solve almost all the problems that lithium presents for grid-scale power storage. To put that into perspective, that's on par with the $0.04 to $0.06 per kWh that the Department of Energy (DOE) estimates as the midrange for new U.S. solar power plants. 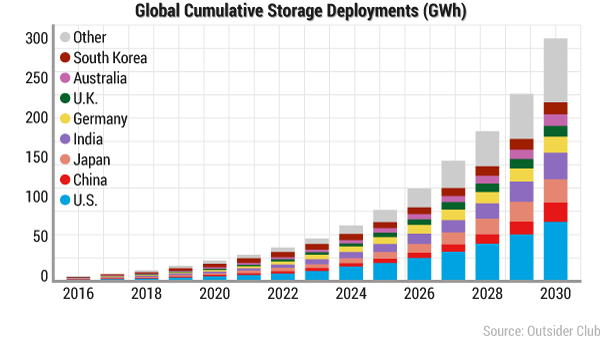 The combined cost of generation and storage for solar power and vanadium batteries is lower than many coal and natural gas power plants that operate today. The importance of this milestone can't be understated. It's the breakthrough needed to fuel a massive expansion of power grid energy storage. With the shift in Chinese steel demand and a mounting demand from batteries, the investment world is wondering where new supply will come from. There isn't a single primary source of the stuff in all of North America. But that's why markets do what markets do. 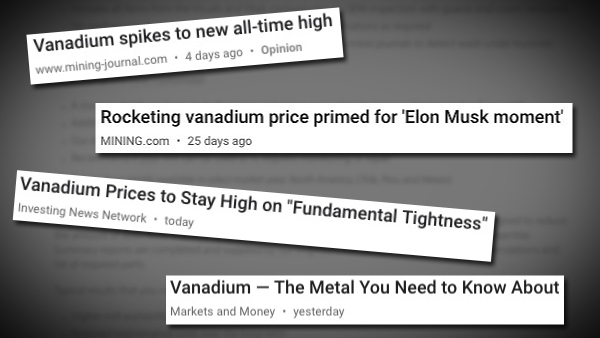 The price of vanadium will rise until enough new supply is incentivized to come online to quell concerns. Outsider Club will continue to keep you posted on the latest opportunities to capitalize on this battery storage breakthrough. Keep an eye on your inbox. Nick is the founder and president of Outsider Club and the investment director of the thousands-strong stock advisories Early Advantage and Wall Street's Underground Profits. He also heads Nick's Notebook, a private placement and alert service that has raised tens of millions of dollars of investment capital for resource, energy, cannabis, and medical technology companies. He's the coauthor of two best-selling investment books, which includes Energy Investing for Dummies. His insights have been shared on news programs, in magazines, and in newspapers around the world. For more on Nick, take a look at his editor's page.